The values from the two previous data periods are also shown in the graph. Telenor Norway is yet again providing its customers with 4G the highest share of time – 94%. Although highest in the Nordics, it is lower than the 99,4% population coverage that Telenor communicates in its marketing. The difference can be explained by customers being indoors whereas population coverage normally is defined outdoors – and customers spending time in other locations than their home. Tele2 Sweden is the runner-up with 93% and Telia Norway takes the bronze in this category with 92%. The podium looked exactly the same in the previous update. Three operators allow for their customers to be on 4G 90% of time: Telia Sweden, Ice Norway and TDC Denmark. Ice fell a bit since the last update. This can be due to statistics; the operator is the smallest of the fourteen and the confidence interval is therefore wider [88,9%-91,7%]. Another reason could be that Ice in this time period expanded its own network quite a lot so that it today to a much lesser extent relies on national roaming on Telia’s network. 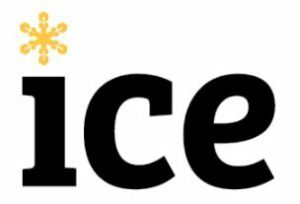 In September 2018, Ice reported that it reached 83% population coverage with its own network carrying 63% of the total data traffic. 3 Sweden again has the lowest value among the Nordic operators, 76%, but the improvement trend is obvious. The same goes for its sister operation 3 Denmark at 79%. Who has the network with the highest 4G availability in the Nordics? Telenor Norway. Our next graph ranks the fourteen operators after average download speed – regardless of if 3G or 4G has been used. 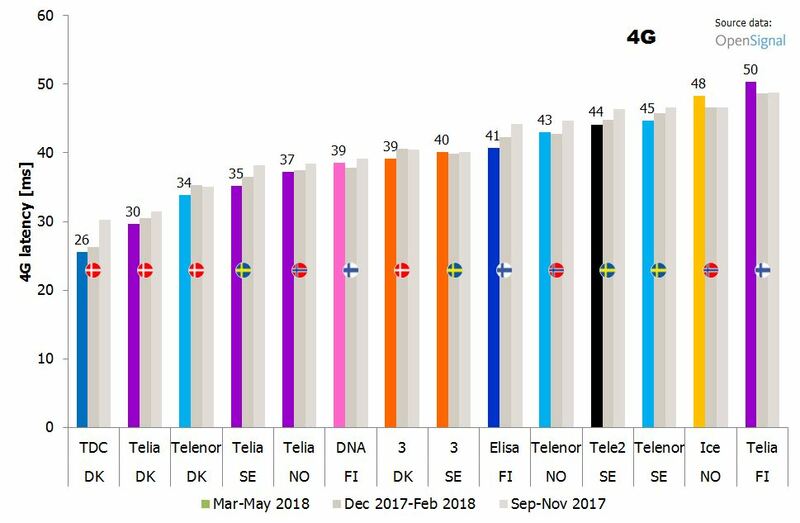 The Norwegian operators Telenor and Telia are leading the speed race in the Nordics – just like in the previous two updates. 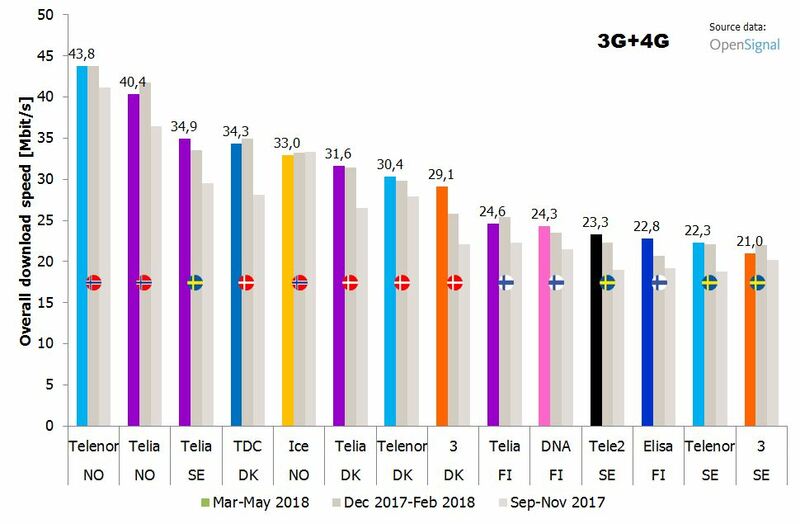 Telia Sweden has – in contrast to all other operators in the top 5 – increased its average download speed and now takes the bronze in this category. The operator that delivered the biggest lift in average download speed is otherwise 3 Denmark. It’s still the network that provides the overall slowest experience in Denmark, but it now has Telenor and Telia (that shares the same network in Denmark) in reach. The Finnish networks Telia, DNA and Elisa provide only moderate average speeds. Compared to the other three countries, Finland has a much higher load per subscriber. This should explain some of it but it’s also important to remember that mobile subscriptions are charged based on maximum throughput in Finland. A contracting share of the subscription base has decided that higher speeds aren’t worth the extra money and the speed throttling that such customers experience is of course reducing the average speed. 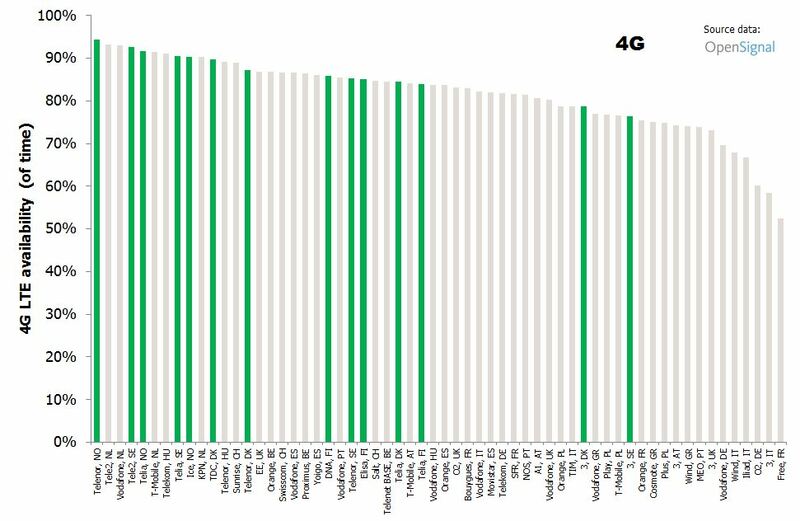 Just like in the 4G availability chart, 3 Sweden is the operator in the bottom of the chart. The average subscriber only experienced 21 Mbit/s. Last time, 3 Sweden wasn’t last but two operators – Tele2 Sweden and Elisa Finland – passed 3 Sweden since the previous update. Who has the network with the highest overall download speed in the Nordics? Telenor Norway. One could rightly argue that if the download speeds are consistent and reliable it doesn’t matter much to the smartphone experience if the speed is 21 or 44 Mbit/s. With the chatty apps, social media and web pages that prevail today, the experience of speed might actually rather be defined by the latency. The lower the latency, the shorter waiting time a user will experience while accessing whatever interactive service he/she uses. If ranking the 4G latency of our fourteen Nordic operators we note that the order is very different from when we look at speed. The three Danish networks TDC, Telia and Telenor have the lowest latency, thus providing the best experience for interactive applications. TDC’s 4G latency is as low as 26 ms. The compact size of Denmark compared to Finland, Norway and Sweden could be an explanation; signals might not have to travel that far, passing less of delaying network nodes, on its way back and fourth to the backend servers the signals want to reach. But it might also be how the networks have been built. 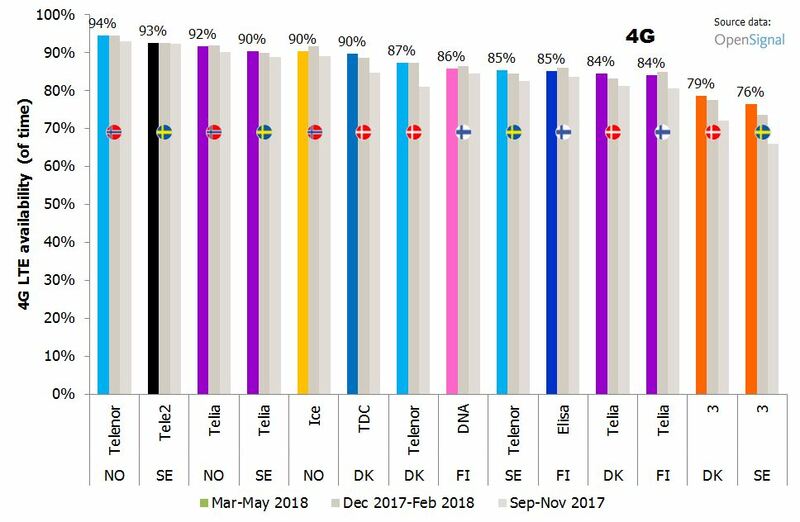 Among the Norwegian operators, Telia has a significantly lower latency than Telenor and Ice. This is logical in relation to Ice as Telia’s network provides a higher throughput – but it’s not logical in relation to Telenor since Telenor wins over Telia in throughput. Another example of that latency and speed don’t always go hand in hand is 3 Sweden. Its latency of 40 ms is lower than that of Tele2 and Telenor (share the same 4G network) even though 3 Sweden’s speed was the lowest in the Nordics. The least reactive 4G network experience – with an average latency of 50 ms – is offered by Telia Finland. This hasn’t stopped Telia from becoming deeply engaged in latency demanding gaming and e-sports activities in Finland. Gamers are perhaps not playing over mobile networks anyhow? Yet. As you know, 5G promises a reduction in latency. Who has the 4G network with the lowest latency in the Nordics? TDC. While the engineers and management of TDC Denmark and Telenor Norway now have another win to celebrate, we would just like to remind everyone that whereas these two operators provide the best mobile experience in the Nordics based on these three metrics for its customers where they tend to be, it doesn’t mean that TDC and Telenor would have the best network in every location. It is also difficult to compare different countries as customers have different usage and location patterns. One thing is clear, though: We have access to extraordinary well covering 4G networks in the Nordics. The graph below highlights the position of the 14 Nordic operators (in green) when it comes to 4G availability when compared to operators in the Netherlands, Hungary, Switzerland, Belgium, the UK, Spain, Italy, Austria, France, Germany, Portugal, Poland and Greece.